HOWO T series, the new generation products of high safety, reliability and economy, is manufactured by SINOTRUK by introducing the German MAN technology, manufacturing equipment and factory inspection standards and combining with Chinese unique situation the over 50 years’ experience in manufacturing heavy-duty trucks. HOWO T7H cab inherits the HOWO- A7 cab once awarded the “2011 Chinese Patent Award of Excellence”, which is unique and masculine in modeling. 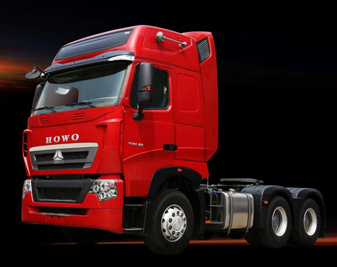 For HOWO T7H as a family member of road vehicles, the large-span less-leaf spring and the four-airbag cab air suspension are used to enable the users in China to enjoy the driving pleasure which can only be brought in by the internationally most advanced heavy-duty trucks. Besides, T7H cab is provided with the world top-class active and passive safety, with the impact indices designed as per the Swedish Standard and the steering column capable of absorbing impact & deformation energy; the customized cab, being standard, upgrade or deluxe, falls into 6 types in total, providing for users in China the pleasure from European standard safety driving. Besides, the cab is designed with low wind resistance, and calibrated after strict wind tunnel test; more specifically, the T7H high-roof 6X4 tractor truck with double berths, for example, boasts a wind resistance down to 0.55 when driving on the plain highway at a speed of 90 Mile and under a rated load of 55T. MC11, a kind of engine localized from the world top-class MAN engine, boasts a displacement of 10.518L and features excellent structure, low speed & high torque, high reliability, low failure rate and high cost performance, with its maximum power up to China III 430 PS (or China IV 440 PS). MC11 series engine also leads the whole country in applying the internationally advanced vermicular graphite cast irons; thus, the engine will not get deformed even after running for 1,000,000 km. The main bearing and connecting rod used in the engine are manufactured by the internationally advanced cracking technology, which, on one hands, helps to realize high-precision positioning, lower bearing bush wear and longer service life of engine; on the other hands, makes the engine lighter as the traditional crankcase is no longer needed. For the fuel supply system, the BOSCH high-pressure common-rail system is applied to deliver the Mobil Delvac XHP super 10W-40 special diesel oil, thanks to which, the initial engine oil change interval for T7H road vehicle is up to 60,000 km. To our credits, such typical designs of water duct, fuel duct and intake manifold adopted for the MC11 cylinder block fundamentally eliminate the water leakage and fuel leakage between cylinder block and cylinder head as well as the air leakage at the intake manifold; specifically speaking, both cylinder block and cylinder head are featured with independent cooling water circuit and lubricating oil circuit, but between them, the water and oil ducts are also provided, completely eradiating the risk of water and oil leakage between them. The MC11 engine enjoys a B10 life of 1,500,000 km, keeping up with the internationally advanced level. In addition to that, the engine boasts an extremely wide low-torque range at low fuel consumption, allowing the engine to run with low fuel consumption both at low speed and high speed and thus effectively reducing the fuel consumption; more accurately, the minimum fuel consumption of MC11 engine is 186 g/KW.h, which is 10 g (more than 5%) lower than the conventional engines currently used in China. The MCY13 (Q) axle for T7H series products is made through German MAN technology. The active and passive bevel gears are Oerlikon products with high transmission efficiency of 98%. The inter-wheel differential lock is optionally available, and the hub bearing unit is supplied by SKF, the leader of the world rolling bearing industry. With these advantages, the MCY13Q axle achieves an oil change interval of 100,000 km (free of first maintenance). The advanced MAN frame makes the vehicle lighter, structure more reasonable and performance more reliable. T7H series models are compatible with the leading international and domestic unique U.S. Hendrickson HUV rubber suspension, 400 KG lighter than the ordinary leaf spring suspension and having maintenance-free features. A large number of top international, foreign-owned or joint-ventured parts and components are adopted; for example, ZF steering gear and oil pump; WABCO air compressor, clutch control system, truck brake valve, various gearshift system control valves; German VOSS brake fittings; MANN+HUMMEL fuel filtration system, air filter; VDO instrument and electric control module; BEHR intercooler and radiator; German TMD disc brake friction block and so on. The super long warranty period of 36 months / 300,000 km for the tractor truck shows our high degree of confidence for the product quality, but also reflects our infinite love to you. Tractor trucks, cargo trucks, dump trucks and mixer trucks, etc. and other special purpose trucks modified from their chassis, with driving modes of 4×2, 6×2, 6×4 and 8×4, etc., and engine power ranging between 310 PS and 440 PS.